Susan Hymel, Angela Gregory historian, speaks in The Gregory restaurant, Watermark Hotel, Baton Rouge, at the launch of A Dream and a Chisel, 7 February 2019. Sculptured murals by Angela Gregory may be seen above. Nancy Penrose, co-author, speaking in The Gregory restaurant, Watermark Hotel, Baton Rouge, at the launch of A Dream and a Chisel, 7 February 2019. Susan Hymel, Angela Gregory historian, speaks in The Gregory restaurant, Watermark Hotel, Baton Rouge, at the launch of A Dream and a Chisel, 7 February 2019. 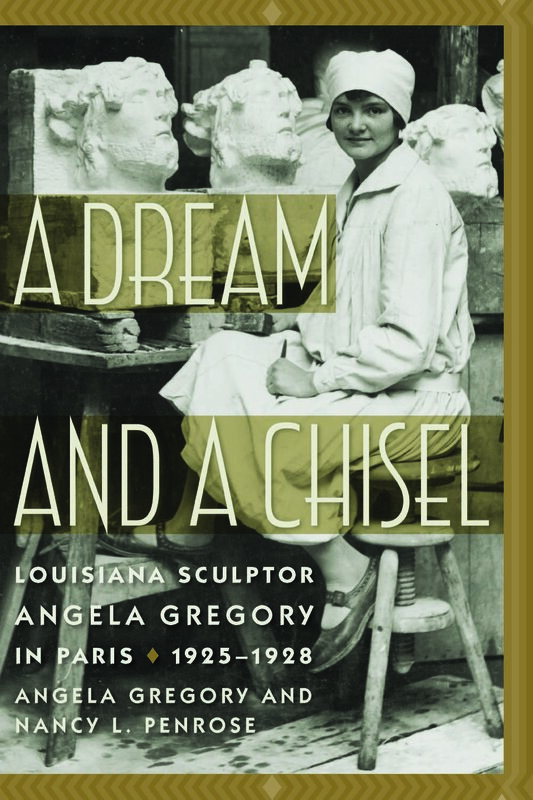 Nancy Penrose, Co-author of A Dream & A Chisel, a story about Louisiana Sculptor Angela Gregory, joins us this week as our Artist to Watch. We talk about her background in geology and research and how her love of travel links into her love of writing and the story of Angela Gregory’s time in France as a young artist. What is your background? Were you always interested in art, history, writing? I have a very eclectic background! I have an undergraduate degree in geology. It was while I was managing a marine geology research lab at the University of Rhode Island that I took a free writing class at a local library and was encouraged by the teacher to keep going. A woman science writer on staff at the University took me under her wing and mentored me in meshing my background in science with my writing. That combination led me into very interesting jobs through the years. I retired in 2014 after fifteen years in a position at the University of Washington in Seattle as writer, editor, and outreach coordinator for a big ocean science research program that built an innovative ocean observatory off the coast of Oregon. I have always loved the arts and, again, it was a teacher who first inspired that interest when I was in high school. One of the things I love about being a writer is that any and all kinds of topics are open for me to explore! Back in the early 1990s I had the good fortune of taking a two-week workshop from writer and natural historian Terry Tempest Williams just after her book Refuge had been published. I love the beauty of her writing and her powerful commitment to the environment and to wilderness, her fierce passion for the value of telling our stories. I also adore Pico Iyer’s writing about travel (The Global Soul) and stillness (The Art of Stillness). I love to travel and have been a traveler my whole life. The first time I lived overseas was when I was very young in the late 1950s in Tehran, Iran, and our family had a wonderful experience there. The irony is that I also love my home ground of the Pacific Northwest. I like to say I am a rooted traveler. Much of my writing in recent years, aside from my work on the Angela Gregory book, has been in the form of travel essays published in literary magazines. To me, writing about travel is like a free return trip and gives me the opportunity to delve deeply into some aspect that captured me during the journey. What was it like working with Angela Gregory on the memoir? I met Angela Gregory in 1983 when I was working as a writer at Tulane and I was sent to interview her for a story. It was at that first meeting that I learned she had always wanted to write a book about her years in 1920s Paris studying with the great French sculptor Antoine Bourdelle. I asked her a fateful question: would she like my help? A Dream and a Chisel is the answer to that question! My husband and I lived in New Orleans for nearly six years for his job as a geophysicist, and for most of that time I was working on the book with Angela. It was such a marvelous journey she and I took together, capturing her years in Paris as she fulfilled her dream of becoming a sculptor. We did all our work on the book in the wonderful atmosphere of her studio on Pine Street surrounded by her sculptures and paintings. We became close friends and our friendship will always be one of the most cherished of my life. The Prologue in the book describes in some detail the story of writing the book together and our friendship. Well, the process of going from writing to publication has been a very long one! Before Angela’s death in 1990 we had a completed manuscript that she had approved. Over the next decades I sent out the manuscript many times to many different publishers. I often received very nice rejection letters! It was not until late 2014 when, through a connection made by my dear Baton Rouge colleague Susan Hymel, I sent the manuscript off to Melissa Walker and Giselle Roberts, editors of the University of South Carolina Press series Women’s Diaries and Letters of the South. They were very excited about Angela’s memoir and it fit well with their series because the book weaves excerpts from Angela’s 1920s letters and journals with her voice as an 80-something woman looking back on her life and career as a sculptor. Why is it important for us to study and research these local artists? You here in Baton Rouge are fortunate to live near some of Angela’s best-known and publicly accessible work: there are her eight of the bas-reliefs on the exterior of the State Capitol; the Governor Henry Watkins Allen monument in Port Allen; and her stunning sculptured murals that have been so beautifully restored by Elise Grenier in The Gregory restaurant in the Watermark Hotel. Angela felt that artists have a role as historians, translating into art what they see and feel in the life around them. Her murals in The Gregory, done in 1949, certainly provide important history of the Baton Rouge area. What is Angela Gregory’s legacy? Her legacy lives on in her works on public buildings and spaces in Louisiana and also in the collections of several institutions. On this trip I visited the Old State Capitol Museum and saw the one-third-size maquette of the Bienville monument that Angela did in the 1950s. Sally Williams did the superb restoration on that piece and it is truly stunning, accompanied by very well-done explanatory panels. The full-size bronze sculpture is on the edge of the Quarter in New Orleans. Angela’s legacy also lives on through the students she taught through the years as professor at St. Mary’s Dominican College. Here in Baton Rouge you have sculptor Debbie Luke who was a student of Angela’s. The book she and I wrote together now becomes part of her legacy. Although she was the subject of many articles through the years, this is the first full length book about her. Susan Hymel and I put a lot of effort into creating the Appendix at the end of the book, which is a listing, a catalogue raisonné, of all of Angela Gregory’s sculptural works and their locations, if known. This is the first such listing, as far as we know. Would you consider writing a full biography of Angela Gregory? I think a full biography of Angela Gregory should be written but I don’t think I’m the right person to do it. I believe it should be done by an art historian from the area who has the knowledge and expertise to place Angela’s body of work within the context of her place in art history. I loved writing the book about her years in Paris and even see it as a kind of travel book because it is the story of a young American woman living in French culture for three years. But I don’t think I’m the best person to do the full biography. What are your thoughts on the arts/literary opportunities in Baton Rouge? Wow! In just the short time I’ve been in town I have been very impressed with all the arts-related activities and institutions. I just don’t have time to explore and visit them all on this trip. It is so obvious you have a community that strongly supports the arts in this area. I have just finished a book-length collection of travel essays and am starting the process of finding a publisher. Also, I have continuing and serious concerns about climate change and the challenges now faced by life on our planet. I am looking for ways to lend my combination of skills to work that will prevent the worst possible scenarios from happening. Write every day; keep sending out your work to get it published; and keep working to improve your craft. I have a favorite writing guru in Seattle, Priscilla Long, and I try to take at least one workshop from her each year. My writing always improves after one of Priscilla’s classes! The good news is you don’t have to live in Seattle to benefit from her wisdom: She has just come out with the second edition of her book The Writer’s Portable Mentor: A Guide to Art, Craft, and the Writing Life and I highly recommend it. Writers at all levels will find something in there to help improve their craft and lives as writers. Where can people go to read your work online? A selection of my essays that have been published online are linked from my website at www.plumerose.net. Your readers might enjoy my recently published piece in The Ekphrastic Review titled “Two Studios,” which explores why I felt so home in Angela Gregory’s studio.